기본정보 오스트리아 Mberg 사의 오리지날 제품. ▷ Lup.X는 Wolf-tone 이 발생하는 정확한 위치에 고정할수있습니다. ▷ Lup.X는 Wolf-tone 문제에서 매우 정확하고 효과적입니다. ▷ Lup.X는 일반적인 Wolf-eliminator 제품들에 있는 고무튜브 부품이 없어 수명이 반영구적입니다. ▷ Lup.X는 일반적인 Wolf-eliminator 제품들의 고무부품의 노화에 따른 기능의 변화가 없습니다. ▷ Lup.X는 설치와 분리, 조정이 간편하며, 나사등의 부품이 없어 깔끔하고 우아한 디자인의 제품입니다. the lup-x clamps on the string on a haghly defined contact point. this makes the lup-x uniquely precise and effective against problem wolf-tones. it also does not contain materials like rubber. will keep its rich sound across its whole range. the lup-x is easy to mount and adjust. 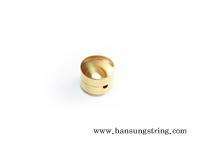 elegance well suited to traditional bowed stringed instrument.